Henry County is a county located in the U.S. state of Virginia. As of the 2010 census, the population was 54,151. The county seat is usually identified as Martinsville; however, the administration building (where county offices are located and where the board of supervisors holds meetings), county courthouse, Henry County Sheriff’s Office and its jail are located on Kings Mountain Road (SR 174) in Collinsville. Not to be confused with Henrico County, Virginia. Henry County is part of the Martinsville, VA Micropolitan Statistical Area. The county was established in 1777 when it was carved from Pittsylvania County. The new county was initially named Patrick Henry County in honor of Patrick Henry, who was then serving as the first Governor of Virginia, and some of whose relatives had settled in the area. Governor Henry also had a 10,000-acre (40 km2) plantation called "Leatherwood plantation" (for Leatherwood Creek) in the newly named county (where he ended up spending 5 years between his third and fourth gubernatorial terms). In 1785 the northern part of Patrick Henry County was combined with part of Bedford County to form Franklin County. In 1790, Patrick Henry County was split again: the western part became Patrick County and the rest remained Henry County. Other notable early settlers included: George Waller, Captain George Hairston and Major John Redd, all of whom were present at the surrender of General Cornwallis at Yorktown; Col. Abram Penn, a native of Amherst County, Virginia, who led his Henry County militia troops with the intention of joining General Nathanael Greene at the Battle of Guilford Courthouse during the Revolutionary War; and Brigadier General Joseph Martin, for whom Martinsville is named. Also prominent were Mordecai Hord, a native of Louisa County and explorer, who lived on his plantation called Hordsville; and Col. John Dillard, born in Amherst County, Virginia in 1751, wounded at the Battle of Princeton during the Revolution, and later a member of the Committee of Safety. Captain Robert Hairston, a noted politician in the Colony of Virginia, owned Marrowbone plantation, commanded a militia company and served as Henry County's first high sheriff. During the War of 1812, the 64th Virginia Militia, under Captain Graves, was formed in 1815 from Henry County. Benjamin Dyer was a lieutenant, then later a captain, of the 5th company of the 64th Virginia Militia.Private Alexander Hunter Bassett would later work large tobacco plantations in the county, and Wyatt Jarrett. Tavner Hailey (b.1793) of Martinsville became an early pioneer in Tennessee and served in the War of 1812. He was 1st Cpl. in Captain Brice Edward's Company, 64th Regiment, Virginia Militia." During the American Civil War, the 42nd Virginia Infantry was formed in part from Henry County volunteers. Its state senator, Christopher Y. Thomas, owned Henry's former Leatherwood plantation and would later briefly serve in the U.S. House of Representatives after the war. He was succeeded by George Cabell, a Confederate army veteran (38th Virginia Infantry) born in nearby Danville and from a family long prominent in the area. In 1902, the Henry County Historical Society was incorporated at Martinsville with its first officers being John W. Carter, J. Harrison Spencer and C. B. Bryant. According to the U.S. Census Bureau, the county has a total area of 384 square miles (990 km2), of which 382 square miles (990 km2) is land and 2 square miles (5.2 km2) (0.5%) is water. The county's six districts are as follows, in alphabetical order: Axton, Bassett, Collinsville, Horsepasture, Reed Creek, and Ridgeway. As of the census of 2000, there were 57,930 people, 23,910 households, and 16,952 families residing in the county. The population density was 152 people per square mile (58/km²). There were 25,921 housing units at an average density of 68 per square mile (26/km²). The racial makeup of the county was 89.47% White, 10% Black or African American, 0.16% Native American, 0.41% Asian, 0.03% Pacific Islander, 1.39% from other races, and 0.92% from two or more races. 3.46% of the population were Hispanic or Latino of any race. There were 23,910 households out of which 28.60% had children under the age of 18 living with them, 54.30% were married couples living together, 12.20% had a female householder with no husband present, and 29.10% were non-families. 25.80% of all households were made up of individuals and 10.30% had someone living alone who was 65 years of age or older. The average household size was 2.40 and the average family size was 2.87. In the county, the population was spread out with 22.30% under the age of 18, 7.50% from 18 to 24, 29.00% from 25 to 44, 26.10% from 45 to 64, and 15.00% who were 65 years of age or older. The median age was 39 years. For every 100 females, there were 95.10 males. For every 100 females age 18 and over, there were 93.00 males. The median income for a household in the county was $31,816, and the median income for a family was $38,649. Males had a median income of $26,660 versus $20,766 for females. The per capita income for the county was $17,110. About 8.80% of families and 11.70% of the population were below the poverty line, including 15.20% of those under age 18 and 12.60% of those age 65 or over. Henry County is represented by Republican William M. "Bill" Stanley in the Virginia Senate, Republicans Charles D. Poindexter, D.W. "Danny" Marshall, III, and Les R. Adams in the Virginia House of Delegates, and Republicans Tom Garrett and H. Morgan Griffith in the U.S. House of Representatives. As an independent city since 1928, Martinsville is not part of Henry County, but exists as an enclave, surrounded by the county. 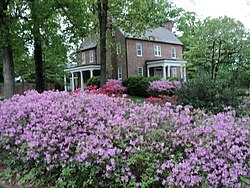 ^ born in Stafford County, Virginia, George Waller lived on his plantation at what was once known as Waller's Ford, today's Fieldale. He married to Ann Winston (Carr) Waller, Patrick Henry's first cousin. Col. Waller's wife's sister was married to Col. Mordecai Hord. Col. George Waller's daughter, Mary Winston Carr Waller, married Major John Redd of the Continental Army. ^ General Joseph Martin, by John Redd, Publications of the Southern History Association, Vol. VII, No. 1, January 1903, Washington, D.C.